Priced extremely well with recent updates in a private and wooded Cul-de-Sac close to Callawassie Amenities. Immerse yourself in one of the more natural and quiet areas of Callawassie Island. The property consists of a vaulted living room with fireplace, bookshelves, and a spacious Master Suite, leading to living room and kitchen. The back porch and deck overlook mature live oaks and pine trees draped in Spanish Moss. 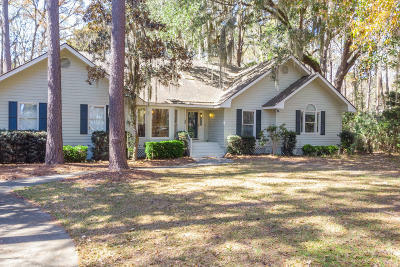 A perfect scene that is classic ''Lowcountry Living'' at it's finest. Lastly, a comfortable seized 2 Bay attached garage is perfect for vehicles and golf cart!